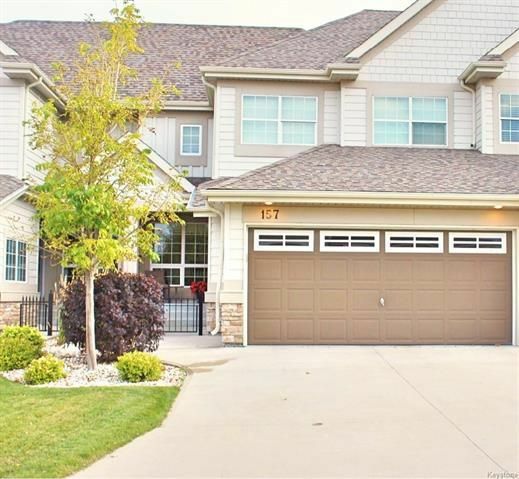 Best views of the lake in beautiful Sage Creek! 2-storey townhouse style condo has a cozy contemporary feel with this open floor plan, which includes hickory maple hardwood flooring throughout,custom paint, granite kitchen w/ breakfast island,stainless steel appliances & kitchen nook with doors leading to your private covered deck overlooking the waking path & lake. Great room offers an abundance of natural light,gas fireplace with stone surround & 20' ceilings. Main floor also offers formal dining room, laundry room and powder room. Upper floor offers 2 generous sized bedrooms & 4 piece bath. Huge master has gorgeous views,walk in closet, deluxe ensuite with jetted soaker tub & glass surround shower. Enjoy entertaining in your finished basement with TV area, games area, storage room & workshop. Pets allowed. Also includes central air, central vac with all attachments, double attached garage & fully landscaped front and back yard. Book your appointment today!